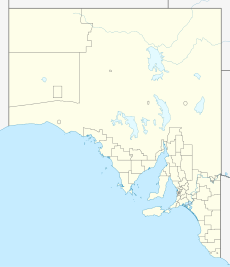 Moorak is a locality in the Australian state of South Australia located in the state's Limestone Coast region. The name Moorak may be a native word for "Mountain", but not from the local tribe, according to Doctor Browne who was an early landowner. The 2016 Australian census which was conducted in August 2016 reports that Moorak had a population of 1226 people. Moorak is located within the federal division of Barker, the state electoral district of Mount Gambier and the local government area of the District Council of Grant. ^ a b Australian Bureau of Statistics (27 June 2017). "Moorak". 2016 Census QuickStats. Retrieved 22 April 2018. ^ a b c d e f "Search result for "Moorak (Locality Bounded)" (Record no SA0046076) with the following layers selected - "Suburbs and Localities", "Place names (gazetteer)" and "Development Plan Layers"". Property Location Browser. Government of South Australia. Retrieved 22 August 2016. ^ a b "District of Mount Gambier Background Profile". Electoral Commission SA. Retrieved 28 March 2016. ^ a b "Federal electoral division of Barker" (PDF). Australian Electoral Commission. Retrieved 28 March 2016. ^ a b c "Monthly climate statistics: Summary statistics Mount Gambier Aero (nearest weather station)". Commonwealth of Australia , Bureau of Meteorology. Retrieved 17 August 2016. This page was last edited on 21 April 2018, at 20:12 (UTC).